Elevated liver enzymes usually first develop 18 hours after acetaminophen overdose. The typical metabolic picture of aspirin overdose is metabolic acidosis and respiratory alkalosis. Urinary alkalinization is effective for aspirin and phenobarbital overdoses. Urinary alkalinization traps the drug in the urine and it gets excreted. Dolobid (an old NSAID) can give a false positive drug screen for aspirin. The treatment of seizures due to INH overdose is pyridoxine. Pyridoxine improves the production of GABA. INH causes an anion gap acidosis. Valproic acid overdose can cause CNS depression, miosis, prolonged QT, electrolyte abnormalities, and elevated ammonia level. Treat with airway control, give L-carnitine, consider hemodialysis. Indications for dialysis are respiratory depression, metabolic acidosis and high valproic acid levels. When looking at ethanol and toxic alcohols, the more carbons that are present in the molecular structure the more inebriating the alcohol. Isopropyl has 3 carbons so it makes you more inebriated than ethanol which has 2 carbons. The less carbons present in the molecule, the more toxic the substance is. Methanol has one carbon so it is more toxic than ethanol. Ethylene glycol has two carbons but the glycol moiety makes it renal toxic. *osmolalgap calculationIt is ok to round 2.8 to 3 and 4.6 to 5 when taking the test to make the calculation easier. Jimson weed has anticholinergic effects. Iron poisoning: The most common iron preparations such as ferrous sulfate have 20% elemental iron. If the patient ingests 20mg/kg of elemental iron they have risk of toxicity. So for test-taking the number to remember for iron toxicity is 20. 20% elemental iron is most common in pills, and 20mg/kg is a dangerous ingestion. A concerning serum iron level is above 350mcg/dl. If the child is not vomiting by 6 hours after ingestion, significant toxicity is unlikely. Treat iron toxicity with whole bowel irrigation, supportive care, IV fluids, deferoximine. If liver toxicity is identified transfer to a transplant center. Deferoximine changes urine to vin rose wine color. 1. Please speak with the MAR whenever admitting a patient to inpatient medicine or OBS. 2. When collecting a specimen of any kind, bring a patient label in with you to the room before you obtain the specimen. Check the label against the patient’s wristband. Initial/time/date the label. 3. Please complete the ACGME survey ASAP. 5. If interested in a global health experience in Tanzania this coming fall, please speak with me. 6. Wellness issues: Be alert to your own and your fellow residents’ mental and physical health. 7. Avoid excessive caffeine use. 8. Adderal has significant arrythmogenic risk and should never be used off-label for alertness when working nights or taking tests. It should only be used under the supervision of a physician experienced with it’s use for FDA indicated diagnoses. When doing an ultrasound guided central line be sure you can fully compress the vessel prior to puncturing the skin with the needle. If you are able to compress the vessel, that rules out a clot in the vessel you are planning to place the line. Elise Hart comment: To make sure your probe is lined up properly (right to left) with the screen, put some gel on the probe and touch the right side with your finger and then touch the left side of the probe with your finger and make sure that you are seeing the corresponding image on the right and left side of the screen as you touch the probe. When doing an IJ place the left side of the probe into the angle of the SCM and the clavicle. Keep the probe perpendicular to the surface of the neck. Angle the needle at about 30-45 degrees from the neck. Mike prefers the long axis view of the vessel when doing an ultrasound-guided peripheral line. Mike will identify the vessel and the course it is taking in the arm. He then has the nurse cannulate the vein. He feels that if he can identify the course of the vessel, the nurse can cannulate the vessel no problem with a longer needle. The reason the nurse can’t cannulate the vessel without ultrasound is usually that they don’t know which direction the vessel is going. The longitudinal view of a vessel is the best way to identify the direction the vessel is taking proximally. 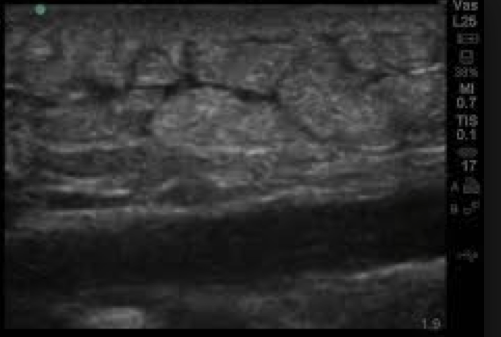 Harwood comment: If a patient says the abscess is draining some already, still take a look with the ultrasound. You will be surprised that there is still significant abscess collection that requires I&D despite some drainage of fluid. Mike discussed the technique of placing a femoral nerve block. He identifies the femoral nerve lateral to the femoral artery with ultrasound and slowly injects bupivacaine without epi around the nerve. Mike discussed axillary nerve block technique. When doing pericardiocentesis find the area of greatest fluid and direct the needle right into the fluid from the closest point of entry. If you can identify a significant volume of anterior pericardial fluid there is no lung interposed between skin and pericardial space. No need to use the subxyphoid approach if you are using ultrasound and can identify significant fluid. When doing thoracentesis, you can use ultrasound to identify the location of the fluid. Also, using a linear probe you can identify the rib level that the diaphragm moves up to with expiration and make sure you are placing the needle above the maximal upward movement of the diaphragm.